London: Sphere Books Ltd, 1989. The Sphere Books Ltd. paperback edition of Tony Hillerman's The Ghostway, the sixth novel in Navajo Mystery Series and third novel featuring Sergeant Jim Chee of the Navajo Tribal Police. Sphere books published several of Hillerman's novels, and each of their covers follow a similar format: a multimedia collage, over a rough canvas base, that incorporates folk art elements and kitschy signifiers of the novels' plot elements. In this case, two feathers, one dipped in red paint or blood, surrounded by four different herbs, presumably representing contents of a medicine bundle, are framed by multicolored course string embroidery, with a secondary framing device of abstract and repeated geometric patterns. Sphere books Ltd is a continuation of the Gollanz Ltd publishing house, who first published a British edition of The Ghostway in 1985. [i] excerpt, [ii] Also by author and publisher,  title page,  publisher's imprint 1 3 5 7 9 10 8 6 4 2 and copyright,  dedication,  blank, 5-184 text,  order form, - advertisements. Binding: Paper covers with full cover graphic on front. 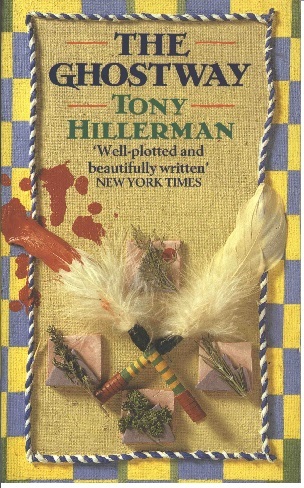 The spine is lettered: [horizontally] THE GHOSTWAY | TONY | HILLERMAN | [vertical] [publisher's device]. The title appears in a dark purple print with the author's name in a blue print.